At home we have a computer hooked up to our TV. It has two TV tuners, and is set up with Windows 7 Media Center to record our favorite television shows (and automatically detect and skip commercials). It's wonderful. We can also watch Blu-ray movies, access Netflix, Hulu, Amazon Unbox, and any number of other streaming services right from our living room TV. This post is not about that computer. This post is about my laptop. Occasionally, when traveling, or when simply in another room of the house, I like to use Windows Media Center on my laptop. Currently, it's running Windows Vista, so in order to be able to view shows in the .wtv format used by Windows 7's Media Center, I have installed the "TV Pack" unofficially leaked by Microsoft. It works great. Basically, I browse to the file I want to watch on a shared drive (I have a shortcut to the Recorded TV folder on the desktop), double-click it, and it plays on the laptop. The commercial scan files are automatically synced. When traveling, I usually copy what I want to watch to my Laptop's hard drive, but there's also this. So, what's the problem? My laptop won't sleep. Or hibernate. At least not all night. It wakes up at 3:30 AM to download the latest TV listings, even though I never configured it to work with a tuner, so it has no listings to download. Needless to say, this is annoying. It drains my battery unnecessarily, and if it's in its case, there's a danger that it will overheat. Launch the Task Scheduler. 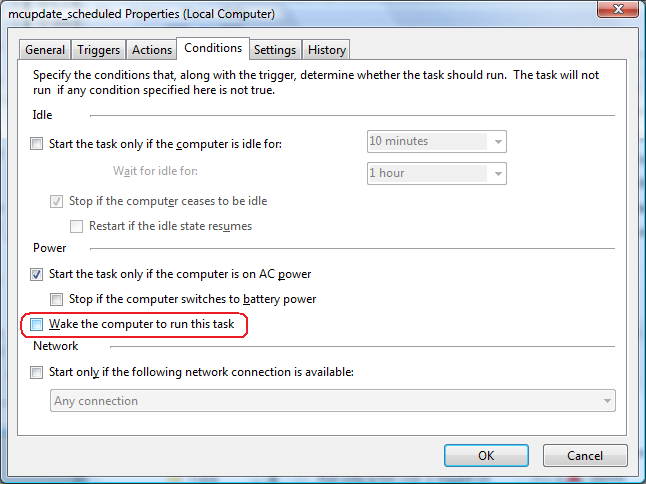 You can do this by opening the Start Menu, typing "Task Scheduler", and pressing Enter. You will get a UAC prompt, which you should authorize. 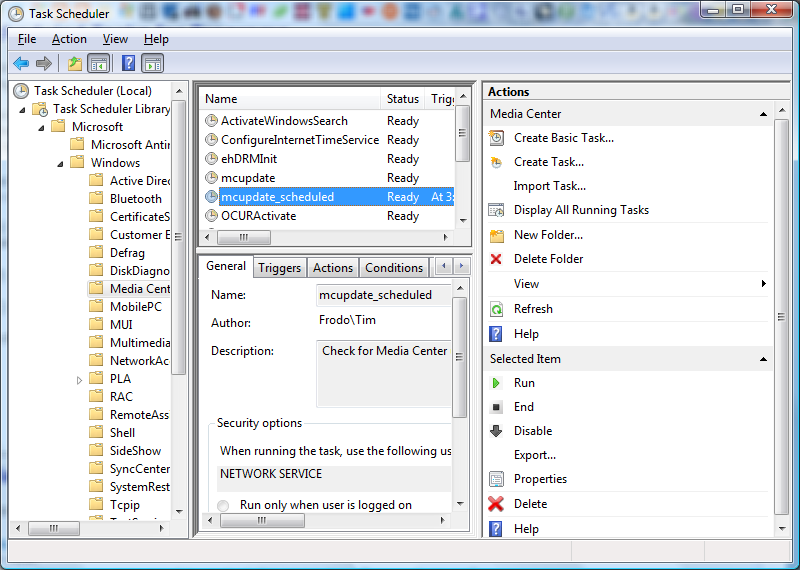 Once you have selected Media Center, look on the top middle pane for a task named mcupdate_scheduled. 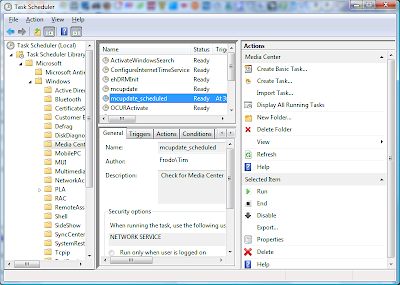 Double-click this task to load the Properties window. 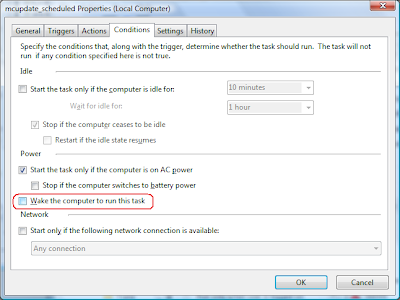 In the Properties window, click the Conditions tab, and uncheck the box next to "Wake the computer to run this task". Click OK, and close Task Scheduler. That's it. No more waking up from hibernate or sleep in the middle of the night!